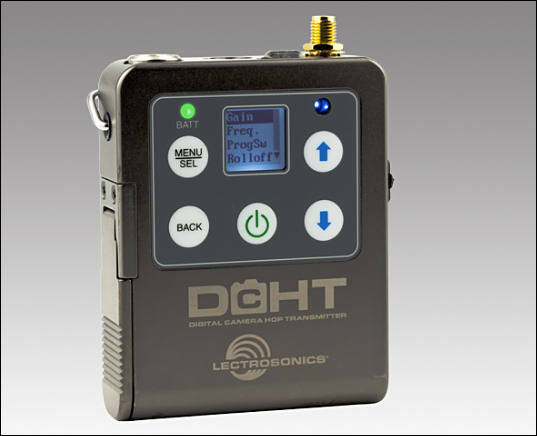 Lectrosonics is very pleased to announce the introduction of the DCHT portable digital stereo transmitter. The new DCHT unit is designed for use in film and TV production as both a wireless audio link from a bag or cart system to cameras and as a portable IFB transmitter paired with the Duet digital wireless M2R receiver packs. The DCHT accepts two channels of mic or line level analog signals or an AES digital signal from a mixer and transmits to the receiver or receivers in a purely digital format. The digital architecture of the new DCHT is a third-generation design with specially developed, high-efficiency circuitry for extended operating time on two AA batteries. The DCHT can be powered either with two AA batteries or with external DC using the optional LTBATELIM accessory. A 2-way infrared port on top of the unit provides quick setup for associated receivers, while firmware updates are made via the USB port on the side panel of the housing. A programmable switch on the top panel can be configured as power on/off, as an audio mute, or bypassed altogether. The DCHT housing is constructed of solid machined aluminum with a special hardened coating for lasting ruggedness. Dimensions are 3.45 x 2.44 x .742 inches (88 x 62 x 19 mm) and the weight of the unit is 6.5 oz. (184 g) with batteries and supplied wire belt clip.